Putting an end to nine years of litigation, the U.S. Supreme Court refused to hear New York City’s request to continue a lawsuit that sought to hold firearms manufacturers responsible for the criminal misuse of firearms. Among the companies sued were Beretta USA Corp., Smith & Wesson Holding Corp., Colt’s Manufacturing Co. LLC, Sturm, Ruger & Co. and Glock GmbH. The city’s lawsuit was originally filed in 2000 by Mayor Rudolph Giuliani and was continued by Mayor Michael Bloomberg. After the Protection of Lawful Commerce in Arms Act was passed by Congress in 2005, a federal judge threw out the New York lawsuit. Then in April of 2008, the 2nd U.S. Circuit Court of Appeals upheld that decision, saying the new law was constitutional. 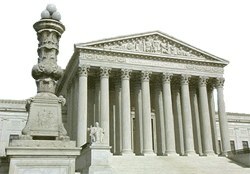 New York City’s final recourse was to appeal to the U.S. Supreme Court, but on March 9th the High Court refused the case. LINK to N.Y. Times Report on NYC Gun Litigation. This report is provided by the NSSF. Share the post "U.S. Supreme Court Rejects NYC Lawsuit vs. Gun-Makers"
Here’s a good deal if you’re looking for reliable, fixed-focal length optic for benchrest competition. MidwayUSA has knocked $43.79 off the price of Sightron SII 36x42mm BRD target scopes — they are now on sale for just $369.99. These same scopes sell elsewhere for up to $450.00. We’ve used this scope model on rimfire and centerfire benchrest rifles from 50 yards to 600 yards, and it worked well. The 1/8-MOA clicks were repeatable and the front-parallax adjustment worked “as advertised”. The scope that is on sale is the SII model that has been available for quite some time. Be aware that Sightron recently introduced an updated “Big Sky” version of its 36-power target scope. This is officially the SIIB 36×42 BRD. This newer SIIB version is slightly longer than the earlier model, and the new model has a bit more eye relief. The main difference is that the earlier model has more elevation adjustment — 50 MOA vs. 40 MOA. Share the post "36X Sightron SII Target Scopes on Sale at MidwayUSA"